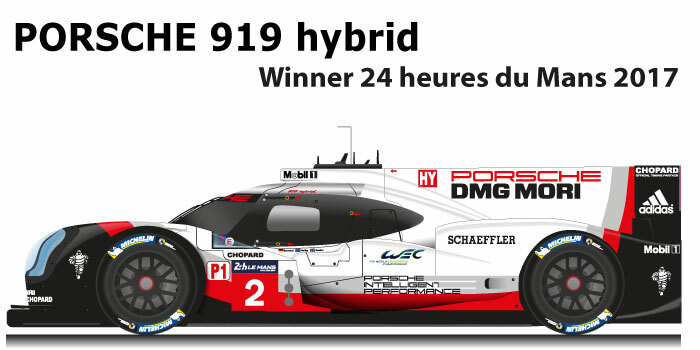 The Porsche 919 hybrid n.2 is the winning car of the 24 Hours of Le Mans in 2017. After the Audi’s withdrawal from the world endurance, Porsche and Toyota were the only manufacturers in the LMP1-H category, with the German champions in charge and Japanese looking for victory in the French race after the scorching defeat at the end of 2016. Timo Bernhard, Brandon Hartley and Earl Bamber won with the Porsche 919 hybrid n.2 the 24 hours of Le Mans 2017, for the German manufacturer was the eighteenth success. In the race the duel between the two manufacturers was affected by the technical problems that hit their cars, the three Toyota from the front row, retired early in the night in an hour. The Porsche n.1 in the lead after the withdrawal of the Japanese cars, was forced to retire on Sunday morning, and the Porsche 919 n.2, the only hybrid LMP1 remained was forced to a comeback that completed one hour from the end. In second place came the Oreca 07 n.38 of the team Jackie Chan Racing with a gap of one lap, while in third place the Oreca 07 n.13 of the Vaillante Rebellion team with a gap of three laps. Composite fibre construction made of carbon fibres with a honeycomb aluminium core. Drive Type: Rear wheel drive, all wheel drive via KERS on the front axle.